Chennaiyin FC finished their 2018-19 Indian Super League (ISL) campaign bottom of the table after a 1-0 loss to FC Goa on Thursday, their 13th loss in the league stage. It's quite alright for a club to finish bottom in the ISL as there's no relegation from the closed league. However, Chennaiyin's fortunes this season are nothing but shocking given that they were the 2017-18 ISL winners ie the ISL trophy holders. John Gregory's side could not repeat their success from the past season, missing key players like defender Henrique Soreno and midfielder Dhanpal Ganesh. What's more, their star striker Jeje Lalpekhlua found the back of the net only once this season, a far cry from the 7 goals he had last time around. Even when Chennaiyin won the ISL in 2015, they had a poor outing the subsequent season, finishing seventh under Marco Materazzi. Back then, Chennaiyin had 15 points in 14 games with 3 victories, 6 draws and 5 defeats. Even the 2015 runners-up, FC Goa, had finished bottom with 14 points in 14 games. They had shocking eight losses and 2 draws. ATK finished ninth on the table with 16 points in 18 games last season, after winning the ISL in 2016. They had 10 defeats and just 4 wins and fired their manager Teddy Sheringham to redirect their fortunes. Sheringham's successors Ashley Westwood and Robbie Keane couldn't pull them out of the pile. But this is the first time that the defending champions finish bottom of the table. Chennaiyin's tally of nine points in 18 games is the lowest for any side finishing bottom. 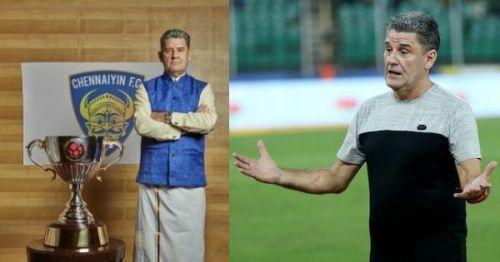 Coach John Gregory has confirmed that he won't continue next season but has the task of guiding Chennaiyin into the knockouts of the AFC Cup. Chennaiyin join a select of league champions to finish in the bottom half of the table. These include Manchester City and Leicester City. Here's our list of league champions who had a difficult time defending their titles. Long before their exploits in the Premier League, Manchester City had a horrid time in the 1937/38 season of the English First Division. City, under Wilfred Wild, clinched the English First Division, the club's first-ever league title, in the 1936/37 season. City went 22 games unbeaten during that season with Peter Doherty finishing top-scorer with 30 goals. After 42 games, Manchester City finished on 57 points with 22 wins, 13 draws and 7 defeats. They pipped Charlton Athletic to the title by a mere 3 points. In the same season, Manchester United were relegated to the Second Division. However, what followed for Man City in the 1937/38 season was disastrous. The same Manchester City finished second from bottom. It was only because of their better goal difference to West Bromwich Albion that Manchester City were able to avoid finishing bottom. City had 12 wins, 2 draws and 7 losses in 42 games.